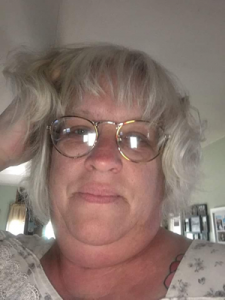 Doreen L. (Grover) Palmer, 54, of Swanzey and a former long-time resident of Winchester died unexpectedly on Friday, October 26, 2018 at Cheshire Dartmouth-Hitchcock Medical Center in Keene. She passed peacefully with the love of family near. Doreen was born the daughter of Pamela (Robbins) and Theodore Grover on August 20, 1964 in Keene. She was educated locally and graduated from Keene High School class of 1982. On August 14, 2000 she exchanged vows with Jeffrey R. Palmer. They were married in a simple service with close family and friends in attendance and have been married for eighteen years. She worked at the Suds Bucket Laundromat in Keene for the past nine years as the manager. Prior, she had worked at the Pub in Keene as a waitress and cook. She had also worked at NK Graphics in Keene doing data entry and graphic designer. Doreen liked to play pool. She was a kind giving soul who would help anyone. Her passion for life was her family, especially her grandchildren. Mrs. Palmer is survived by her husband Jeffrey R. Palmer of Swanzey. Her children; David A. Williams Jr. of Swanzey and Ryan T. Williams of Swanzey. A child from a combined marriage, Haley R. Palmer and her husband Robert of Massachusetts. Parents; Theodore and Pamela Grover of Swanzey. A brother, Jeffrey T. Grover and his wife Stephanie of Dover. Four grandchildren; Cameron Williams, Oliver Williams, Chloe Williams and Aiden Brown. In addition, she leaves; aunts, uncles, cousins, nieces, nephews, extended family and friends.